Even when I was traveling abroad to Ecuador in 2010, I had time for a game of chess with my casual friend, Marco (see photo, right). I was in Ecuador teaching English as a second language. Click TEFL.com for more about the “how” I came to take this adventure to South America, or read my story right here on this website at Teaching English (see this and other Nonfiction pulldown choices, upper right corner). 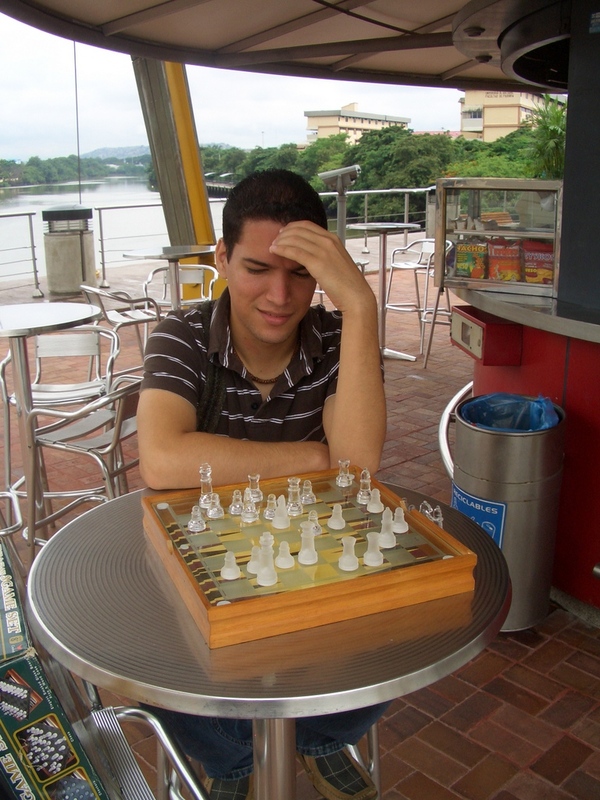 Marco and I played several games along the river in Guayaquil. I spent a wonderful afternoon practicing my Spanish and he his English. No stress! I am inspired and comforted by your ESL/TEFL adventure as I have been here in BsAs since early November and just earned my TEFL certificate through Ibero. I also lived in Tucson for 2 years while Fiduciary of my Aunt Pat. Beautiful country, I still visit friends there. I teach Meditation to the Vietnam Vets at the Veterans Center in Greenacres, Florida. I miss them, that was the last trip I made the day before I left – 2 hour drive to say, ” I’ll see you on my return next year”. Although I taught them all how to apply Reiki, another stress reduction technique, they have taught me a lot more on handling life and how it has affected us. It is always so gratifying to receive comments like yours. Since returning to the US I have had many opportunities to help non-English speakers with their new language. Here in Tucson, I’m a regular volunteer teaching English as a second language to immigrants and refugees who live here. Perhaps the most attractive thing about teaching English is how eager and cooperative every single student is …they simply want to communicate better than they do. Fortunately for me, I conduct “advanced conversation” classes which means I spend less time on basic grammar and more time on higher-level vocabulary, idioms, and “Americanized” pronunciations of the language. This is fun to do, and it helps them reduce their accent at the same time. My sojourn to South America was rewarding on so many levels. Besides the “touristing” one does, I actually lived with a family who spoke no English …I bought groceries with them at their community markets (unlike what tourists EVER see!) …and I sipped coffee with the locals including games of chess in a place in Quito called Gringolandia. I also volunteer at The VA Hospital here in Tucson where I talk regularly with recovering veterans. I’m particularly interested in communicating with vets with PTSD and TBI where I am able to relate because of my own Vietnam experiences (see references to my book, “Just Dust” elsewhere on this site or on Amazon.com). I would be interested in learning about your own successes with veterans …it sounds like there are some parallels to my own journeys.